This one is for the kids (and the grown-ups who love miniature people food?!). 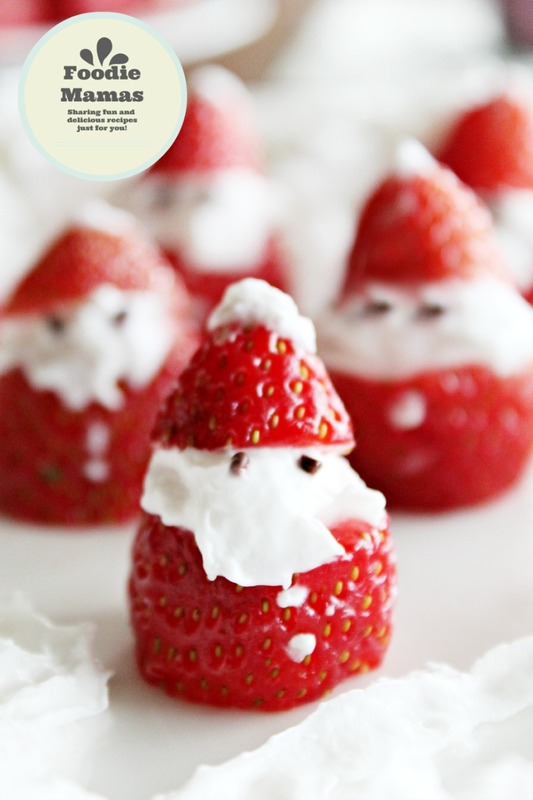 Holiday Strawberry Santas are just so darn cute, everyone will awwwww over them….and then eat ’em up! My son loves strawberries. He kind of goes crazy for them. So what do you think happened when we made these festive guys? Yep, you guessed it, he totally flipped. I consider this a kid-friendly recipe, even though it can be a bit tricky for small hands to assemble. If you’re willing to let perfect symmetry go (as I had to), I think you’ll be pretty happy with your adorable Santa Clauses, in all of their different shapes, heights, beard-widths, and facial expressions. Hehehe, we got some happy Santas, sad Santas, mad Santas…well, you see what I mean. The point is to get creative and have fun! 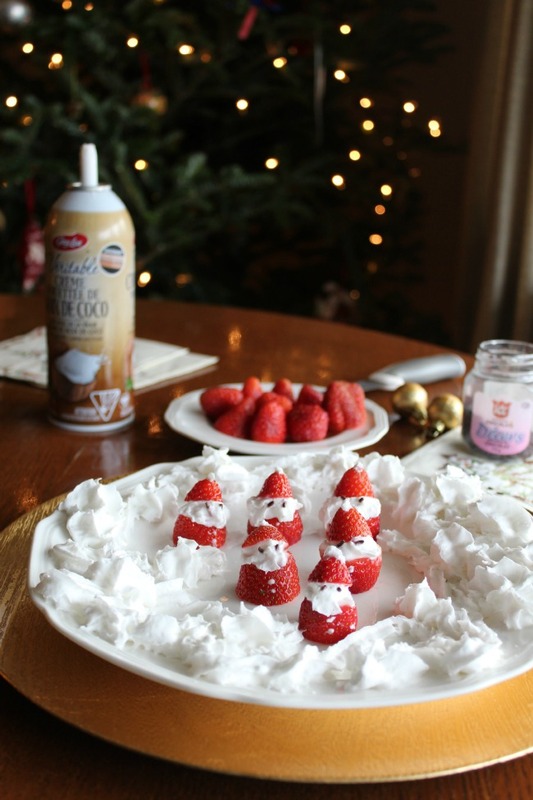 To make your own strawberry Santas, all you need is berries, aerosol whipped cream, and chocolate sprinkles. There are a few other ways to spin this recipe – you could use buttercream or cream cheese frosting and pipe the beards instead of the whipped cream and you could also use mini-chocolate chips instead of sprinkles. It’s up to you! I personally love fresh berries with coconut whipped cream – it’s such a heavenly combo. Using a paring knife, cut off the top of each strawberry to make a flat surface. Cut a 1/2 inch piece from the pointed end of each strawberry. Set aside. Line all the strawberries up and put a swirl of whipped cream where the middle will be. Add the hats on top of each strawberry base. Place two chocolate sprinkles as eyes. Make a swirl of whipped cream on a plate. Using a toothpick, scoop some whipped cream and add buttons and pom-pom to Santa's hat. Serve right away or keep refrigerated until serving time. 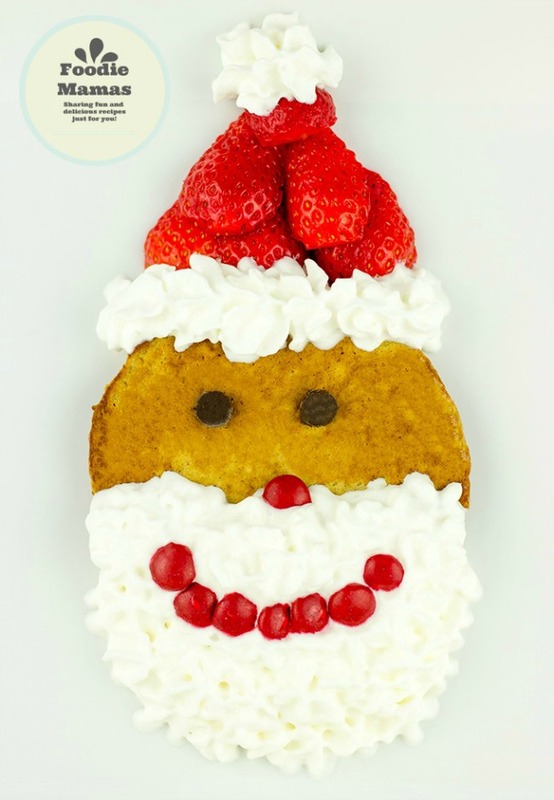 Strawberry Santas are great for pancake breakfasts or served at the children's Christmas table. Enjoy! I hope you enjoy these Christmas treats and have a blast making them yourself or with the Little Ones in your life. 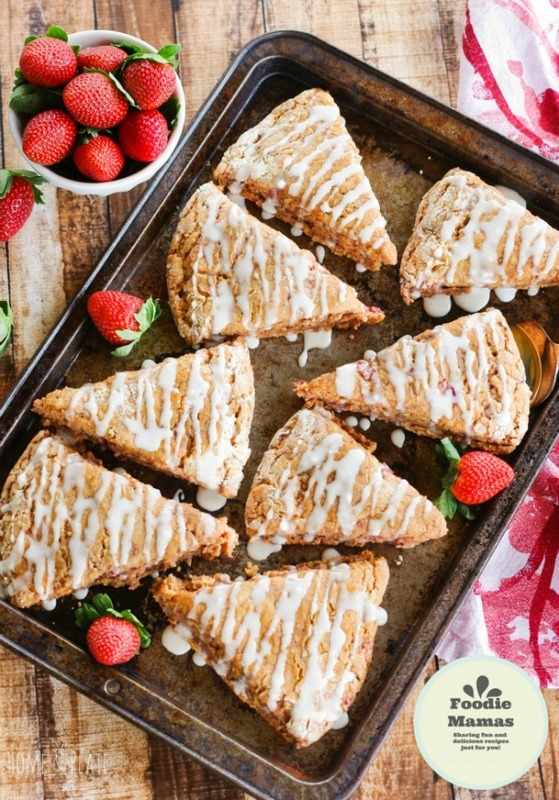 And since we’re all about strawberries this month, the lovely ladies from #FoodieMamas are sharing their must-try strawberry recipes below. Take a look at the mouthwatering treats and click through for the recipes. 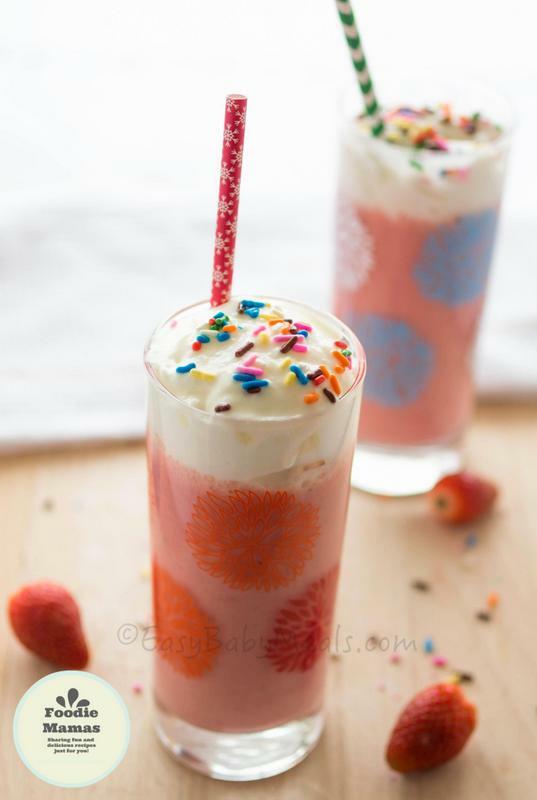 Enjoy all the strawberry-licous goodies! 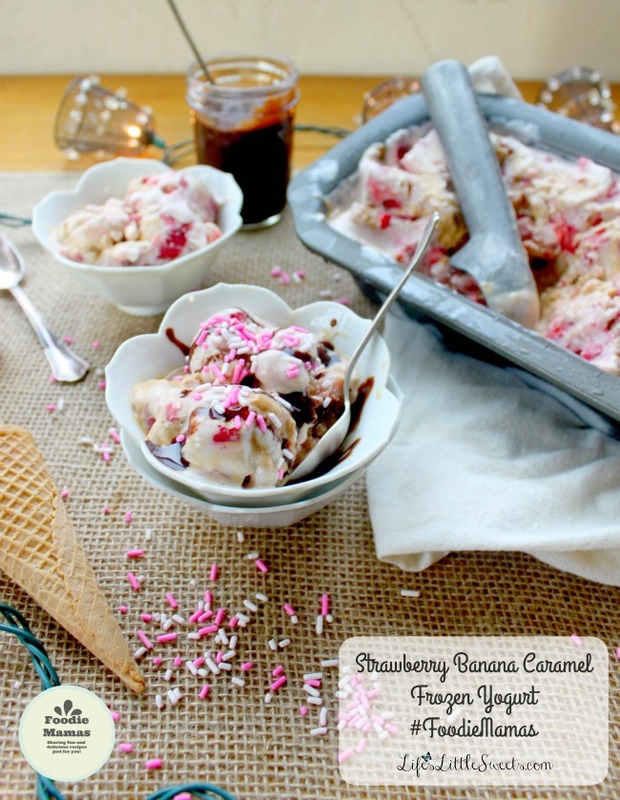 Looking for more delicious recipes by the Foodie Mamas? You got it! 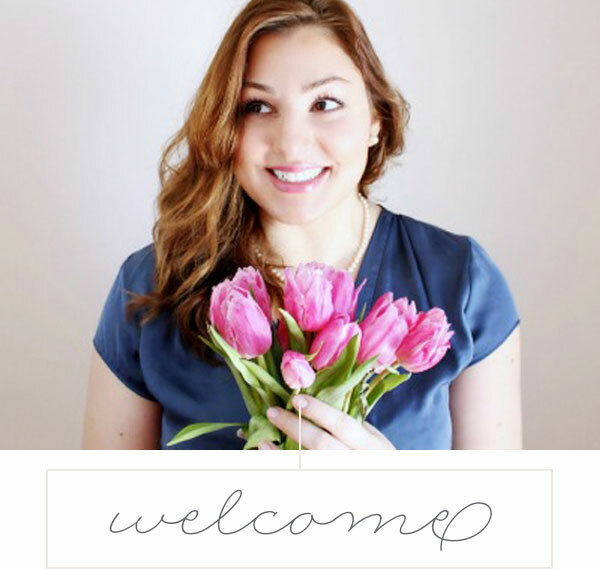 Follow the Foodie Mamas pinterest board and our hashtag #FoodieMamas across social media to see what’s cooking. Pin this image to bookmark all these tasty recipes! 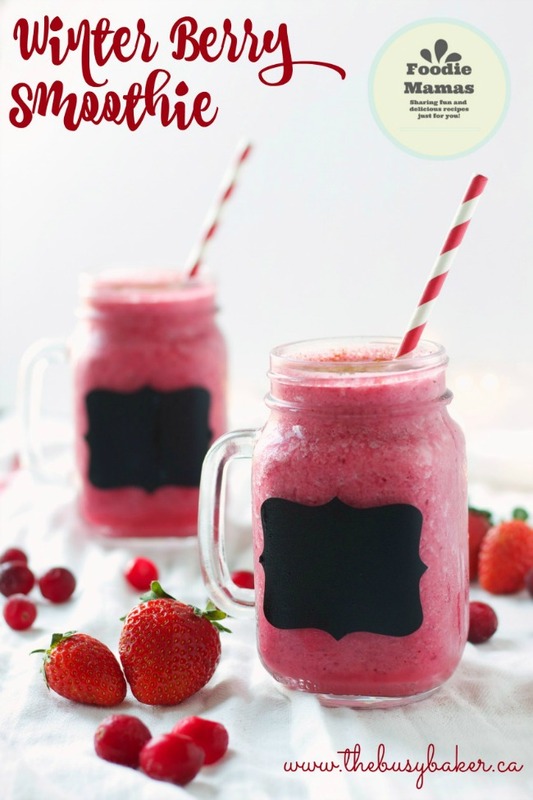 What’s your favourite way to enjoy strawberries? Do you have a must-try recipe? Strawberries are my favorite. The strawberry santas are so cute! I think I can pull that off :). Thanks for sharing all these recipes…they all look so good! I absolutely LOVE the cute little Santa’s, tasting great would just be a bonus!